Looking for some Vegan Gluten-Free Cake Recipes? I’ve posted loads of sponge cake recipes on my blog, so thought it might be nice to have them all in one place. So, if you’re planning a birthday party or if you’re looking for a dessert for some other occasion, you can pick out a cake from this list! All of these recipes are refined sugar free, and they’re seriously indulgent yet secretly healthy. I’ve put together a collection of 30 of my most popular vegan gluten-free cake recipes: there’s a huge range of fruit cakes from lemon, orange and pineapple to strawberry and blueberry; decadent chocolate cakes, including a peanut butter chocolate cake, chocolate truffle cake, chocolate hazelnut cake and chocolate mousse cake; and some others like coconut cake, coffee cake and red velvet cake. This Strawberry Cake is packed full of fresh strawberries, super fruity and naturally coloured! This Banana Cake is seriously moist, fragrant, packed full of sweet raisins and covered in a delicious “cream cheese” frosting! Ever made carrot cake with purple carrots? This Purple Carrot Cake is pretty, colourful and slathered in a delicious “cream cheese” frosting! This Tropical Fruit Cake is easy to make, super moist, fragrant, fruity and slightly boozy! This Jaffa Cake is your favourite sweet treat made giant – it’s full of orange flavour and smothered in a decadent chocolate ganache! This Lemon Poppy Seed Cake is moist and fluffy, sweet and tangy and super easy to make! 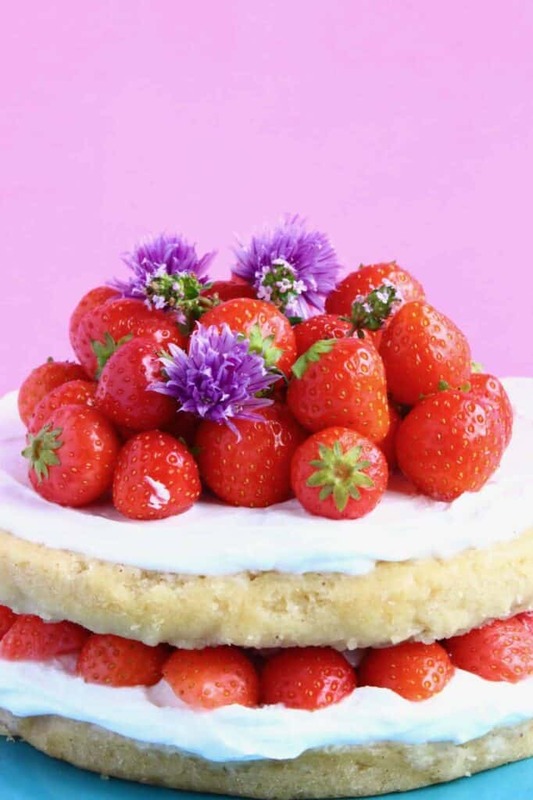 This Strawberry Sponge Layer Cake is moist and fluffy, rich and creamy, and filled with sweet, summery strawberries. A little strawberry jam in the centre adds an extra sweet, fruity surprise! This Lemon Blueberry Cake is a citrusy sponge dotted with jammy blueberries and topped off with a delicious yet healthy “cream cheese” frosting. This Pineapple Upside Down Cake is super easy to make, fragrantly fruity, and just as delicious as the traditional version! This White Chocolate Lemon Cake is bright and citrusy, tastes elegantly of white chocolate and is filled with the most indulgent buttercream frosting. This Orange Cake is moist and fluffy, fresh and citrusy and filled with a rich buttercream! If you’ve never tried matcha and strawberries together, this cake is a must-make: a beautiful pastel green sponge with fruity frosting loaded with sweet berries! This Lemon Drizzle Cake is elegantly simple, incredibly delicious and perfectly tangy. The lemony syrup adds extra moisture and citrusy flavour. This Tropical Carrot Cake is beautifully moist, subtly spiced, and bursting with tropical flavours like dried mango, pistachios and coconut! The tangy “cream cheese” frosting really adds something special. An almond sponge cake filled with sweet dried cherries. A rich chocolate sponge cake sandwiched with a creamy, nutty, fragrant frosting loaded up with desiccated coconut and pecan nuts. This Chocolate Mousse Cake is the best secretly healthy yet seriously indulgent dessert: think moist chocolate sponge, topped with rich chocolate mousse and silky chocolate ganache. This Chocolate Orange Cake is rich and decadent and filled with a touch of tangy, citrusy orange marmalade. This Brooklyn Blackout Chocolate Cake is truly a chocolate lover’s heaven! A chocolate sponge cake frosted with chocolate pudding covered in dark chocolate shavings. This Chocolate Hazelnut Truffle Cake is made with a super fudgy hazelnut sponge and is frosted with luxuriously smooth chocolate buttercream frosting. It’s also grain-free, paleo, date-sweetened and oil-free optional. If you’ve never tried the combination of chocolate and tahini, you must! The nutty, silky tahini frosting pairs beautifully with the rich, moist chocolate cake. This Peanut Butter Chocolate Cake is filled with the most indulgent salty-sweet peanut buttercream, and drenched in a silky chocolate sauce. This Black Forest Cake is super chocolatey, seriously rich, and filled with sweet, juicy cherries. Sinfully decadent yet secretly healthy, this Chocolate Truffle Cake is a dense, fudgy chocolate sponge covered in a luxuriously creamy chocolate buttercream frosting. It’s also grain-free, paleo, date-sweetened and oil-free optional. A vanilla sponge cake filled with creamy custard and topped with rich chocolate ganache! A simple sponge cake filled with sweet strawberry jam and a silky buttercream frosting. This Coffee Walnut Cake is just as delicious as its traditional counterpart: think moist, coffee-infused sponge, tangy “cream cheese” frosting, and crunchy, earthy walnuts. This Coconut Cake is moist and fluffy, perfectly sweet, creamy and loaded with fragrant coconut. This Red Velvet Cake is so much healthier than the traditional version, but every bit as delicious. It’s sweet, salty, sour and chocolatey, and seriously addictive. Plus, this one is naturally coloured using beetroot powder! If you try out any of these recipes, I’d really love to hear any feedback! Please give it a rating, leave a comment, or tag a photo @rhiansrecipes #rhiansrecipes on Instagram! Thank you. loving your page, a customer recommended me your page (I work in retail). got a lot of inspiration now (especially cake wise)! Thank you so much, so glad to hear that! I’ve tried a couple of your muffin recipes, and they are amazing! So glad I found out about your site. Your photos are beautiful, too! Do you have any recipes for waffles? Or can any of the cake/bread recipes be used to make waffles? Keep up the great job you’re doing! I tell everyone I know about your site! Hi Karen! That’s great, thank you so much, really happy to hear that! I think you can probably use this recipe to make waffles: https://www.rhiansrecipes.com/gluten-free-vegan-fluffy-pancakes/. Would love to hear how you get on. Thank you so much for your support!! Hi there thanks for an awesome variety of cakes. Can i make this red velvet cake with raw beetroot. I am trying to incorporate fresh fruit and veg into my puddings and cakes. Thank you! Yes that should be ok, but be careful to only add a tiny bit for colour otherwise it’ll mess up the texture. Would love to hear how you get on!